jill, from the good life for less, put together another awesome round-up of must-see posts this week! style your life whips up a fabulous ensemble in grey and white... I just love the fresh and modern feel of this outfit! the pretty bee makes over her family room... she shows before and after shots (gotta love a "before and after!") that includes this sunny vignette. where is the me in mommy? reminds us of five simple things to add to our to-do list that is sure to brighten our day... my fave: more time for reading to our kids! do. think. wear. see. love. dream. takes on a safari wardrobe challenge and totally knocks it out of the ballpark, or more aptly the wildlife reserve. karina, ink reopens her shop and has a pretty awesome freebie for bloggers - you won't want to miss this! good life for less takes us south of the border for some fun wardrobe inspiration that just screams summer! sweetie pie pumpkin noodle is coveting sand & sea... um, yes me too! Especially this blinged out swimsuit! merci blah blah gets disco fabulous and I couldn't love this belt/necklace combo more! Can you say "whoooo, whooo"? 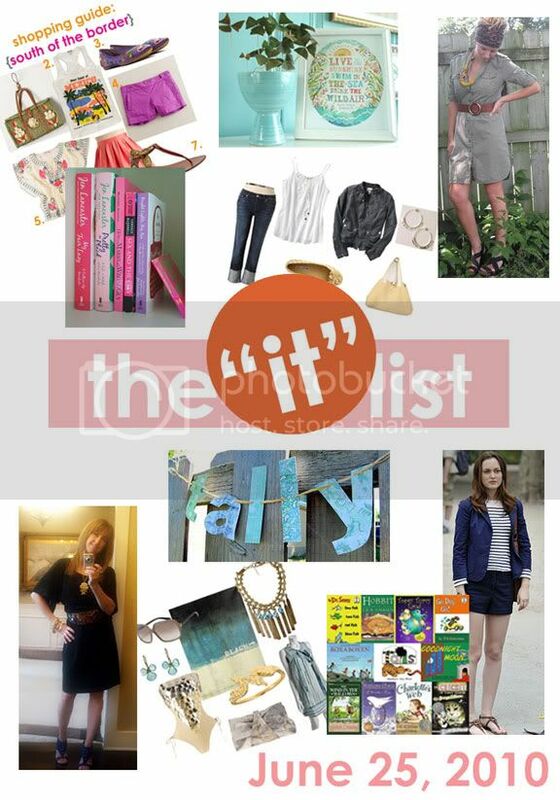 Interested in finding out how you can be featured on the "it" list? Email goodlifeforless @ gmail.com! Some fantastic inspiration--delivered right to your....screen! hmmm, weird! that one should work but i also have a "junk" e-mail address that you can try: buttr33@hotmail.com. i'll watch for it!